"Call Me Maybe" Parody - Pink Bridal Show Knoxville TN from NICHOLAS & KEATON on Vimeo.
" so here's my number... call me maybe..."
Everybody knows the lyrics right? NOW... The Knoxville Pink Bridal Show does it!!!!! Yes folks that's right! We had the lucky opportunity to make a parody of the infamous "Call Me Maybe" song by Carly Rae Jepsen! We got all the fashion show brides, the Pink Bride staff, the audience and all the vendors to join in! A BIG THANK YOU to Olivia Harris (the model bride in the video) & Lisa Cacace-Vizer at Wedding Wonderland. Olivia (she's GORGEOUS isn't she?!) did an AMAZING job rocking it out on the runway in one of Lisa's dresses from Wedding Wonderland! Lisa was also AMAZING to work with, and even let us shoot some footage from backstage before the brides went on stage! A BIG THANK YOU to Fred, Kara, Anna, and all the other Pink Bride staff! You guys did an amazing job and we are SO blessed to be able to work with AWESOME wedding professionals like ya'll! We hope you enjoy it as much as we do!!!!!! PS - Don't forget to check out the outtakes at the end and AWESOME dance moves by Andrew Holloway of Ogle Entertainment! Hey everybody! We are proud to announce a new movie poster for one of our upcoming wedding films! 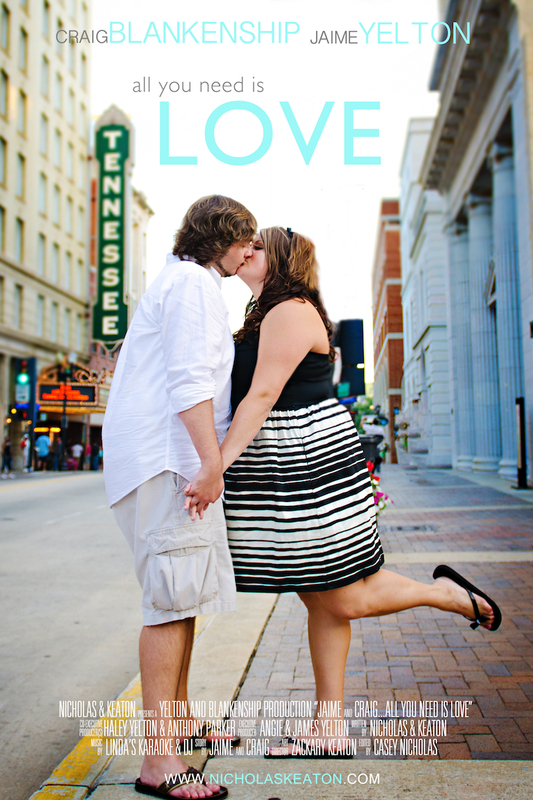 Jaime and Craig will be getting married in September and we are PUMPED to film their special day! Their theme is "All You Need is Love" with their main wedding colors of black, silver, white and tiffany blue. We incorporated all of that into a schhnazzzzyyy movie poster! If you're interested in getting a movie poster of your own, send us an email! info@nicholaskeaton.com !